‘Tom is a gently, dreamy five-year-old boy, who is not verbal, but occasionally vocalises. His mum noticed that he respond positively to musical stimuli of various kinds, and that’s how he began music therapy! After four assessment sessions, it was immediately clear that Tom is a highly tactile child; he explores and investigates his environment by touching and holding objects (and sometimes popping them in his mouth)! For this reason, I decided that Skoog might be an appropriate instrument to draw him into a musical relationship. Tom was intrigued by this strange, colourful object, and delighted by the sounds it made! His first response was to try to eat it, but it didn’t take him long to understand the relationship between touching various parts of it and the different sounds that could be achieved. It proved to be an instrument that we could enjoy a creative relationship through, by turn-taking and playing duets. 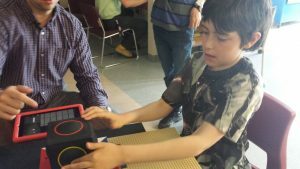 Mostly, his relationship was with the Skoog itself rather than the therapist; in as much as he involved me, he tended to use me as a means to an end rather than communicating – which is expected in the earliest stage of therapy with a client with ASD. 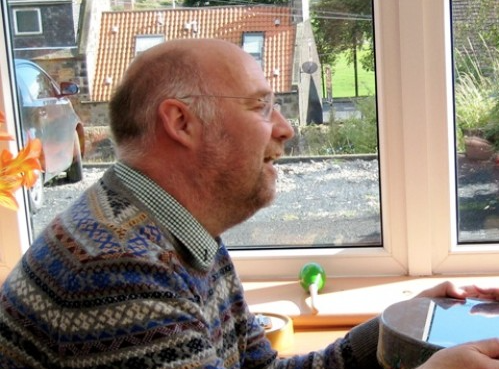 Find out more about Skoog 2.0 here!